The province of Bulacan was once again recognized by the Department of Health (DOH) Region 3 (Central Luzon) for its excellence in providing health programs and services to the communities. 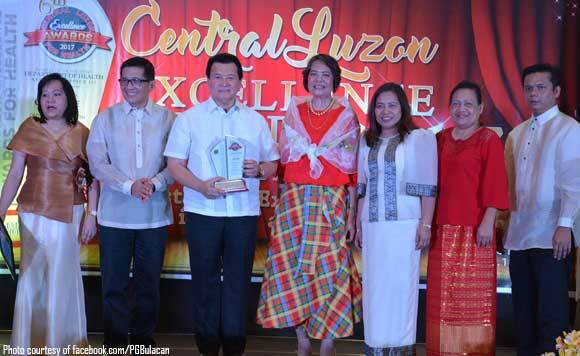 The major citations received by the province in the 6th Central Luzon Excellence Awards for Health (CLExAH) held earlier this week include the Outstanding LGU Health Scorecard Performance for the year 2016, and awards for its outstanding support, commitment and excellent performance in the DOH Philippine Health Agenda. The Bulacan Provincial Blood Center as lead blood service facility in Region 3 also received a certificate of recognition. Likewise, a special citation award was given to Dr. Paul Camiña of the Bulacan Medical Center for his 2017 deployment to the ASEAN (Association of Southeast Asian Nations) 2017. Aside from these, some municipalities of the province also received health awards in different categories. The municipalities of Bustos, Plaridel, and San Ildefonso received the Municipal Category Regional Voluntary Blood Service Program Achievement Award while the City of Malolos received the City Category Regional Voluntary Blood Service Program Achievement Award. The municipalities of Plaridel and San Ildefonso and the City of San Jose del Monte also received awards for their blood program implementation. Meanwhile, the Quality Service Award for the Animal Bite Treatment Center (ABTC) was awarded to the City of San Jose del Monte.